Every time you’re given a new project, you first start with a process of initiating and planning. There are additional things to consider to ensure you start the project off right. Many teams struggle understanding how best to initiate and plan a project. Templates help identify project objectives, scope, risks, assumptions, constraints, milestones and more. Take responsibility for delivering the project, and ensure other stakeholders are accepting their responsibilities as well. Be sure the sponsor will provide strong sponsorship, and that you have adequate funding and resources to complete it on time. Be sure you have a gut feel that the project is achievable. If you have concerns about the viability of the project raise your concern. Taking responsibility does not mean to be an order-taker. It means you also take responsibility to push back when needed. You really need to understand as much as possible about your customer’s business to know why the scope and priorities have been set as they have. Ask your customer what’s driving the deadline of anything, why you can’t reduce the scope further and why the deliverables have been prioritized as they have. This gives you good information to start the planning process. This is one of the most important aspects of starting a project. You need to know who the players are and their roles and responsibilities. You will need this information to know who to talk to for planning the project. You need to uncover the scope of the project to ensure that all of the deliverables to be produced during the project are adequately defined. You don’t want to get part way through the project only to find that your customer actually wanted different or additional deliverables that weren’t planned. Sit down with your customer and clarify all of the deliverables on day one. The complete set of deliverables forms the “scope” of the project and it’s critical that you document these before you get started. Many projects have their deadline and budget set depending on the scope of work and the resources available. On the other hand, some projects are assigned to the project manager with a fixed deadline and budget. These projects can be harder to deliver. 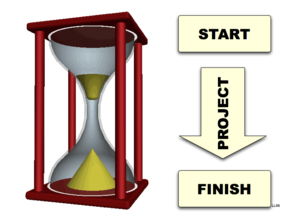 When a project starts it is important to know if you can propose the budget and deadline based on the work, or if these will be constraints given to you ahead of time.